This week the Organisation for Economic Co-operation and Development’s (OECD) Development Co-operation Directorate released the provisional figures for total Official Development Assistance (ODA) by Development Assistance Committee (DAC) members in 2018. The rules governing ODA are changing, and this is the first set of ODA statistics published under new rules regarding how ODA is accounted for.1 Under these rules, only a percentage of each ODA loan is counted as ODA, with the percentage dependent on how "concessional" - provided on terms that are substantially better than the market rate - the loan is. This is offset by the fact that loan repayments are no longer deducted from the final ODA figure for each donor. Donors are also now able to report some additional investments in the private sector of developing nations - known as Private Sector Instruments (PSIs) - as ODA. In order to compare data against previous years, the OECD has published ODA figures for 2018 calculated according to the previous "net ODA" (or cashflow-based) measure as well as the new "grant equivalent" measure of ODA. 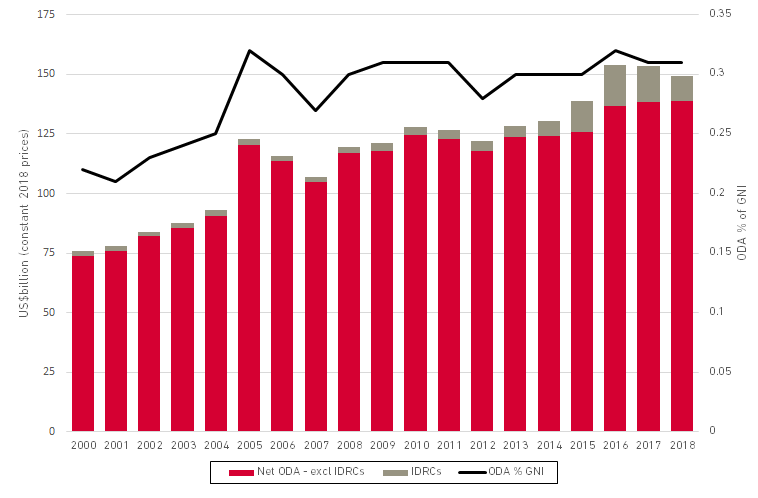 These figures show that total ODA fell in real terms for the second year in a row, down by US$4.1 billion (2.7%) on the net ODA measure and by US$2.5 billion (1.6%) under the new grant equivalent measure, and ODA as a percentage of donors’ Gross National Income (GNI) remained unchanged at 0.31% (having previously fallen from 0.32% in 2016 to 0.31% in 2017). The main factor in the fall is lower in-donor refugee costs (IDRCs), which were down by US$4.2 billion. The largest reductions in net ODA in cash terms were reported by four members of the G7: the US (US$1.8 billion), Japan (US$1.6 billion), Italy (US$1.3 billion) and Germany (US$0.8 billion). Under the new grant equivalent rule, ODA in 2018 is US$3.7 billion higher compared to the previous measure. France and Germany, who give loans at relatively low levels of concessionality and receive less loan repayments than Japan, both have lower levels of headline ODA under the new measure. Under the grant equivalent methodology Japan’s ODA rose to 0.28% of GNI from 0.23%, despite ODA falling by US$1.6 billion on a net ODA basis. Conversely, France remained unchanged at 0.43% despite an increase of US$0.5 billion in net ODA due to the fact that the grant equivalent measure values French ODA less highly than the previous measure. 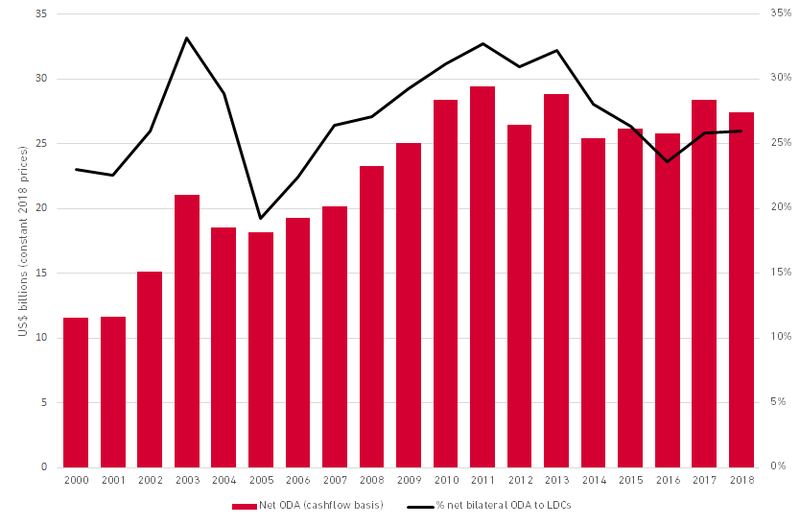 In 2018 total net bilateral ODA to Less Developed Countries (LDCs) fell by US$0.9 billion, leaving ODA to LDCs almost US$2 billion below its 2011 peak (a decline of nearly 7%). Ireland alone gave over 50% of its bilateral ODA to LDCs, and a further seven other donors - Belgium, Canada, Korea, Luxembourg, Poland, Sweden and the US - all gave over 30% of their bilateral ODA to LDCs in 2018. 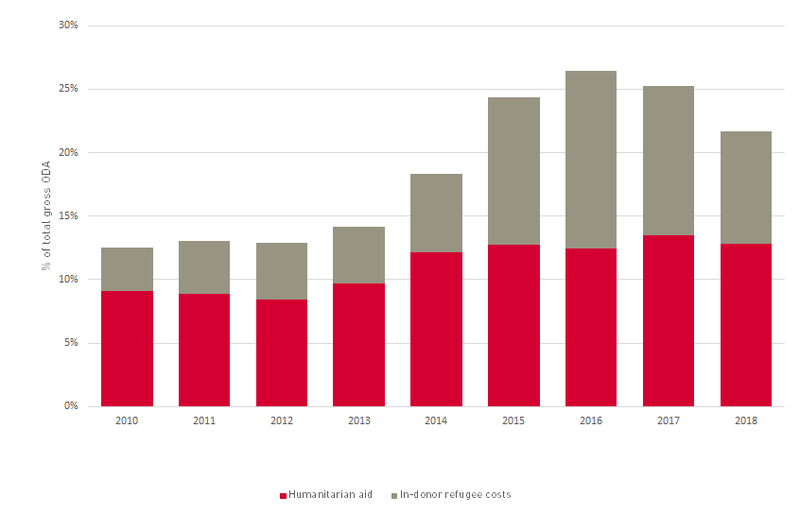 ODA to short-term priorities such as humanitarian support and In-Donor Refugee Costs (IDRC) has fallen from its 2016 peak, but remains at historically high levels: the proportion of total ODA spent on short-term priorities was almost 22% in 2018 compared with less than 13% in 2010. Expenditure on IDRCs fell by US$2.4 billion in Germany, US$0.8 billion in Italy, US$0.3 billion in the Netherlands and US$0.3 billion in Sweden, reflecting not only lower rates of refugee arrivals in Europe, but also a tightening of DAC rules around the reporting of IDRCs. Despite these falls, however, aid to short-term priorities still comprised a much higher proportion of total ODA than was the case prior to 2014. 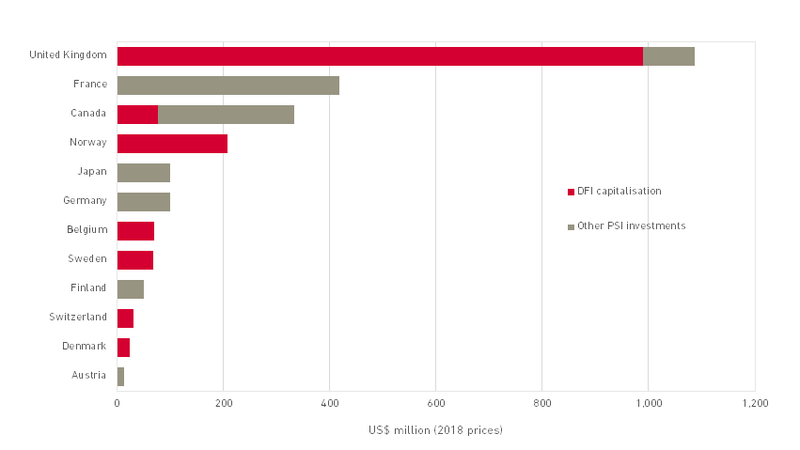 In 2018, a total of 12 donors reported almost US$2.5 billion in ODA expenditure in the form of Private Sector Instruments (PSIs) under provisional reporting arrangements, with three-quarters of ODA-eligible PSI expenditure reported by three donors. Of the US$2.5 billion reported, US$1.5 billion was in the form of increased capital allocations to national Development Finance Institution (DFIs) and US$1 billion in the form of loans and other investments to the private sector within developing countries. 44% of total PSI ODA was reported by the United Kingdom – the majority of which was in the form of capital transfers to CDC Group, the UK’s DFI - with a further 17% from France and 14% from Canada. The amounts reported as capitalisation of national DFIs pose a transparency problem as no data currently exists to indicate the use that DFIs make of this funding. The OECD DAC’s most recent ODA data release is available here, and the full dataset can be accessed via OECD Stat. Further information and relevant downloads are available from the Development Initiatives website. For more information on the changes to ODA rules see the technical note from the UK's Department for International Development (available here [PDF]) and Development Initiatives’ ODA modernisation background paper (available here [PDF]). Under the new grant equivalent formula, the relevant figures (at current prices and exchange rates) were US$34.3bn for the United States (representing 0.17% of GNI), US$25bn for Germany (0.61%), US$19.4bn for the United Kingdom (0.7%), US$14.2bn for Japan, (0.28%) and US$12.2bn for France (0.43%). Under the new rules these repayments are no longer deducted from headline ODA. The change in measurement of ODA has made no difference to the number of donors achieving 0.7%. 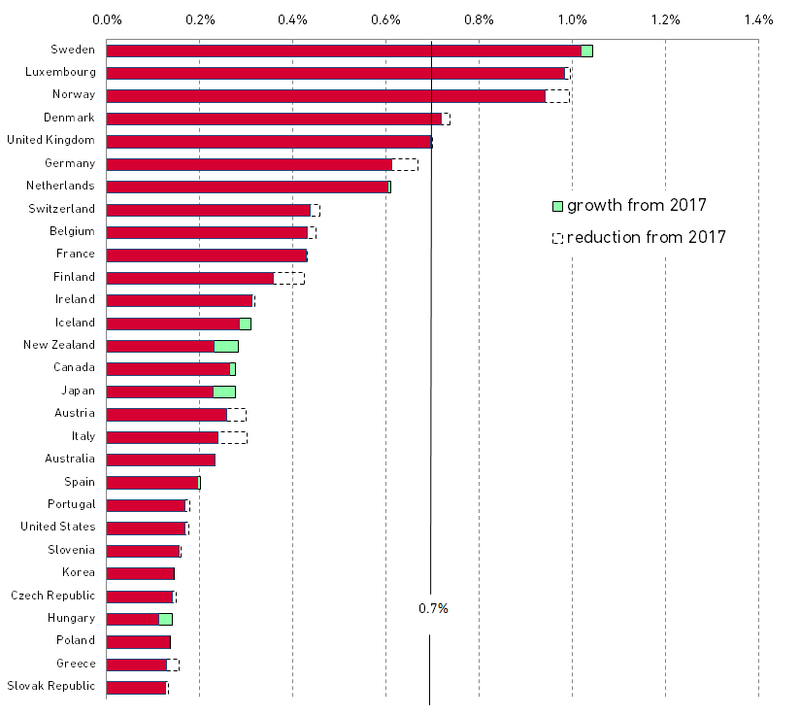 On a grant equivalent ODA basis – the relevant percentages for net ODA are the same with the exception of Denmark (0.71%). The 2017 ODA/GNI % is based on the previous net ODA measure whereas the 2018 ODA/GNI % is based on the new grant equivalent measure. Data ODA to LDCs is only available on a net ODA basis. Germany failed to report how much of its ODA went to LDCs in 2018 so, in the absence of complete data, this chart assumes that Germany gave the same level of support to LDCs in 2018 as it did in 2017. Rob Tew is head of technical development at Development Initiatives, where he plays a lead role in developing methodologies for the analysis of aid data including the aid bundle analysis featured in the Investments to End Poverty series.